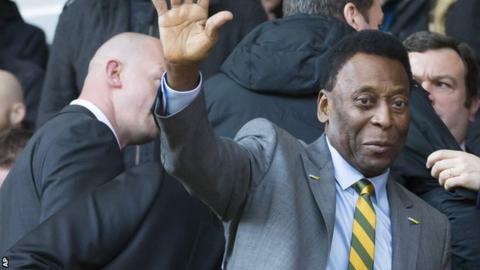 Brazil legend Pele has left hospital after undergoing prostate surgery. The 74-year-old was admitted to the Albert Einstein Hospital in Sao Paolo on Tuesday for the second time in six months. Pele, the three-time World Cup winner, was treated for a urinary infection in November 2014 after having kidney stones removed. He was named Fifa's Player of the Century and won 91 caps for Brazil, scoring 77 goals. Widely regarded as the greatest player of all time, he scored a world record 1,281 goals in 1,363 appearances during his 21-year career. He played 14 games at the World Cup, scoring 12 goals, and was awarded the Fifa Golden Ball as the best player at the 1970 tournament. Pele has only one kidney, having had one removed towards the end of his playing career. Will NY derby be next great rivalry?